It is well known that Lowell Mason (1792-1872) was a major figure in 19th-century American music education. He pioneered the first public school music curriculum in Boston in the 1830s, and thanks, in part, to his efforts music was a integral part of public education for the next 150+ years. If you studied music in grade school, you can thank (or blame) Mason. My own career as an educator and a musician is indebted to Mason’s innovations. With the fall semester about to begin, I find myself wondering about the intellectual, pedagogical, and personal lineages between teachers and students. What can I learn from Lowell Mason’s “family tree” of teachers? Can tracing our own lineages help us understand what kind of teachers we are? Mason’s proposal that all students should have the opportunity to learn music in school represented a striking departure from the prevailing belief that music outside of church was either an artisan’s craft or an aristocrat’s pastime. Greatly influenced by his experiences traveling in Europe as a young man, one of Mason’s early signal accomplishments was the edited translation of G.F. Kuebler’s music instruction book Anleitung zum Gesang-Unterrichte in Schulen (Stuttgart, 1826), which Mason issued as The Manual of the Boston Academy of Music in 1834. It became a core text in American music education. Of course, Mason’s innovations wouldn’t have been possible without the work of his teachers. His training rooted him in an illustrious tradition of Protestant music making. It also connected him directly to an earlier education revolution. In the first decade of the nineteenth century singing schools cropped up, reforming Americans’ undisciplined singing habits and substituting elegant European (or European-style) music for the rustic, “unscientific” hymns that had become popular in the 1770s and 1780s. 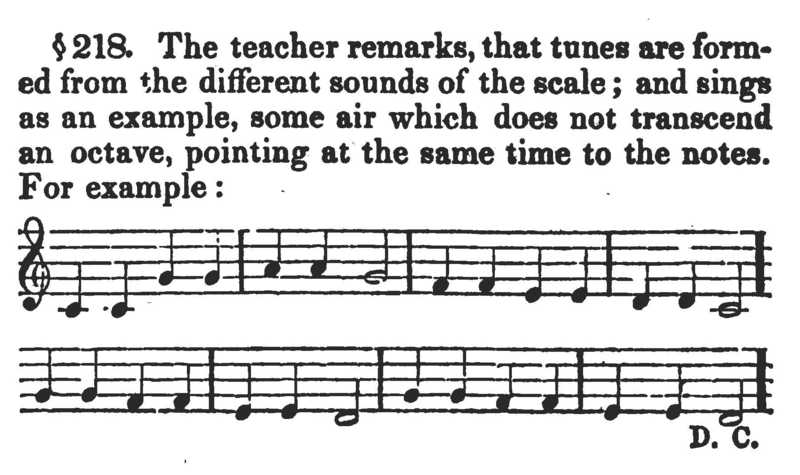 Using new hymn tune compilations that included instructions for how to read and perform music correctly, singing schools instated order and refined tastes during the first decade of the nineteenth century. As a youth in Medfield, Massachusetts, Mason attended a singing school led by Amos Albee, who compiled The Norfolk Collection of Sacred Harmony (1805). Another branch of Mason’s family tree stems from Oliver Shaw, the hymnodist with whom Mason studied as a teenager. Although blinded in an accident, as a late teenager Shaw learned his craft from several teachers, including the German-born composer and publisher Gottlieb Graupner, who in turn had been instructed in music by his father, an oboe player. Graupner was a well-known name in eighteenth-century German-speaking lands; Christoph Graupner competed with Johann Sebastian Bach for a plum job in Leipzig (Bach won). Teacher-student relationships are on my mind as I start a postdoctoral fellowship in a history department and consider what kind of teacher I will be for my students. Since it is a two-year position, I am thinking about the looser connections we form with teachers who aren’t necessarily formal advisers. These connections have been important to me. I have sought out teaching advice from my undergrad professors, including those with whom I took only one course. Unfortunately, the protocols by which junior scholars (such as myself) demonstrate their scholarly credentials and lineages–advisers and recommenders–don’t offer any guidelines for how to acknowledge those members of our teacher family trees who occupy the more slender (but still meaningful) branches. This seems to me to be a shame, since these connections can so meaningfully shape what kind of teachers we become. Michael Broyles, “Lowell Mason on European Church Music and Transatlantic Cultural Identification: A Reconsideration,” Journal of the American Musicological Society 38, no. 2 (1985): 316-348. Nicholas Temperley, Bound for America: Three British Composers (Chicago: University of Illinois Press, 2003); Richard Crawford, “Cosmopolitan and Provincial: American Musical Historiography” in The American Musical Landscape (Berkeley: University of California Press, 1993).